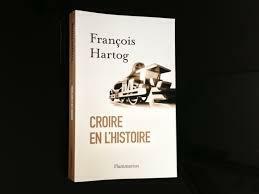 François Hartog, French visiting Fellow at the U of M: "The Future of a Very Old Name"
History has been the "crossroad" word, if not the cardinal concept around which the idea of belief crystallized during the last two centuries. Today, what do we mean when we pronounced the name History? What do we (still) believe in? We have first to fully acknowledge that the previous meaning of the word, that we've depended on, no longer has a hold on the world such as it is, even if it still lingers around. We mean this modern concept of history that Europe launched and imposed; that was entrusted with the people's progress, clothed in a capital "H;" and that which was the locomotive of the modern world, while also pretending to be its ultimate judge. Then, we could ask if this very old name, history, could once again be put into service to designate in a new way the articulation between the three categories of the past, present, and future that human beings have always needed in order to regulate their communal lives. But in such a way that neither category tyrannizes the others, in a world that is no longer, far away from that, the one that which for a long time had regulated the meridian in Greenwich. François Hartog, September 2013 visiting fellow at the U-M Institute for the Humanities, is director of studies at the School of Advanced Studies in Social Sciences, Paris, and chair of ancient and modern historiography. This talk come highly recommended by one of our members, U of M History professor, Nancy Hunt. I just found out. I have read your current post. Thank you. This is not the course that these people are giving in for free as they can allow me to experience it on https://www.essaywritinglab.co.uk/assignment/. I've asked so many people about it and it will be great. too bad that I'm teaching that day. It's always great to learn new things and new authors. Have more than fun, great interest!